The SDS EasyTrimmer has been engineered in exclusive partnership with SignComp to accept their new Zip.Trim product, as well as traditional Jewelite trim cap. 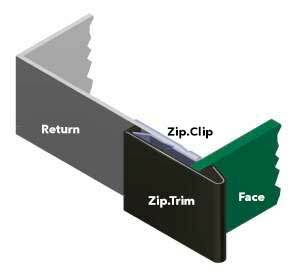 SignComp’s new trim cap product is both fast and easy to install and works seamlessly with our SDS EasyTrimmer. The combination of these two products forms an unbeatable solution, offering ease of installation and the ultimate in precision. SignComp is a well known supplier of extrusion systems and sign kits who evolved from a rich and long history of sign fabrication, installation and service dating back to 1948. Recognizing the value and labor saving benefits of fabricating signs with aluminum extrusions, SignComp was founded in 1986. SignComp provides framing, cabinet and raceway extrusion solutions to the sign industry. Advancements in the production of aluminum extrusions, fabrication techniques, and improvements in paint chemistry and aluminum finishing processes have brought aluminum extrusions to the forefront of sign fabrication. SignComp has dedicated itself to designing, engineering and developing an extensive product line of extruded aluminum profiles to deliver the widest range of options for the modern sign fabricator. SDS’s 20 year history as a leading manufacturer in industrial automation equipment and EasyTrimmer’s reputation as a compact, precise and easy to use trim cap processing machine that processes most of the market’s conventional trim cap are the reasons SignComp reached out to SDS/AdamsTech as an engineering partner for this project. Now, with it’s ability to process Zip.Trim from SignComp, Easy Trimmer makes it possible to trim channel letters even faster than before. When combined with any ChannelBender series automated channel letter benders, EasyTrimmer’s accuracy, speed, and reliability dramatically increase your shop’s efficiency, productivity and quality of your finished product.